In The Age Of Cloud Music, The iPod Nano Endures — But For How Long? I remember my favorite Sony Walkman. It was yellow. And bulky. And slow. And ugly. I loved it. It played cassettes. Cassettes! I took it to Australia one summer. It’s still something I think about from time to time. Just me and my music in this yellow player thousands of miles from home. 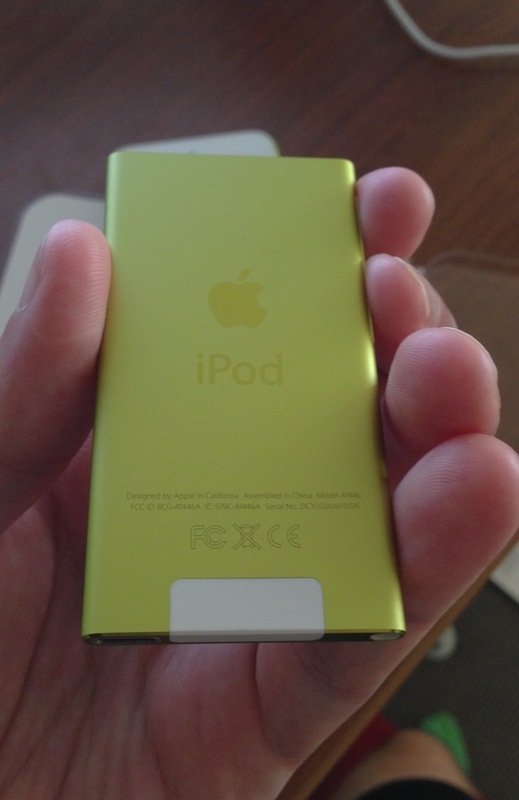 So when Apple asked if there was a particular color of the new iPod nano that I wanted to test out, naturally, I said “yellow”. The difference is that this thing is like 1/20th the size of my Walkman. That’s not scientific. In fact, I think I’m not exaggerating it enough. It’s like 1/2000000th the size. Sure, let’s go with that. It’s really freaking tiny. I think back to the days of the Walkman and the portable CD player and the first iPod and even the first iPod mini, and I’m amazed we’ve come this far. This thing can hold and playback thousands of songs?! It’s so thin and light that it seems like it barely exists. And yet, its wonder is relative. We have devices that can do so much more now. Is this device — that is, the stand-alone music player — long for this world? I actually thought the iPod would have perished a couple years back. It just makes sense to use your phone as your music player, right? It’s crazy now to think that the iPod was once Apple’s biggest money-maker. But it wasn’t even that long ago — just five years ago, the iPod was Apple’s biggest source of revenue. These days, it ranks fourth in the revenue pool behind the Mac, iPad, and of course, the iPhone. The truth is that the stand-alone music player market is decaying. While everything else has been up and to the left for Apple the past several years, iPod sales have been steadily declining year-to-year. But Apple clearly feels that there’s still something left to squeeze out of the market as they not only keep pushing iPod updates, but complete product redesigns. Enter, the new iPod nano. I’ve spent the past few weeks testing out the new nano. Truth be told, it’s been a while since I’ve regularly used a stand-alone iPod. I think the last one I wore down was a third generation nano — you know, the “fat one”. I really liked the last version of the nano, but more as a watchface than as a music player. I once again find myself thousands of miles from home with a yellow music player. I’m in Europe right now and rather than destroy my iPhone battery as I walk around a city, I’ve been using the new iPod nano as my music player. The battery seems to last forever. It’s tiny. It weighs almost nothing. And it’s fast. Whereas the last nano was a touchscreen-only device (aside from volume and power buttons), this new one features a touchscreen as well as a play/pause/skip button (in between the volume buttons). This makes it a much better music player for your pocket since you can use it without looking at it. The new nano also features a “home button” for the first time. Yes, this is derived from the home button that’s now standard on the iPhone/iPad/iPod touch. It’s slightly different in that the center of the button features a perfect circle symbol rather than a square with rounded edges. You’ll notice this matches the difference between the icons on iOS devices versus the nano functions. Clearly, Apple wanted to emulate some of what has worked so well for iOS, but wanted to make it clear that this wasn’t an iOS device. While it does feature “app” icons displayed in a grid, the nano is not running any variety of iOS. Instead, these rounded icons are meant to make the touchscreen obvious and usable. The only “apps” are ones made by Apple (and a Nike Fitness one that has been standard on nanos for a bit). They’re the ones you’re used to: Music, Videos, Podcasts, Photos, Radio, Clock, Fitness, and Settings. And while the home button does the obvious thing — taking you to the homescreen from anywhere in the device’s interface — you can also still go “home” by swiping to the right on the touchscreen, as was the case with the last generation nano. Perhaps the biggest upgrade of this new nano is the larger 2.5-inch screen which reinstates the video-watching functionality that was stripped from the last nano. This makes the nano itself larger (and slightly heavier) than the last generation, but I believe it’s a good trade-off. 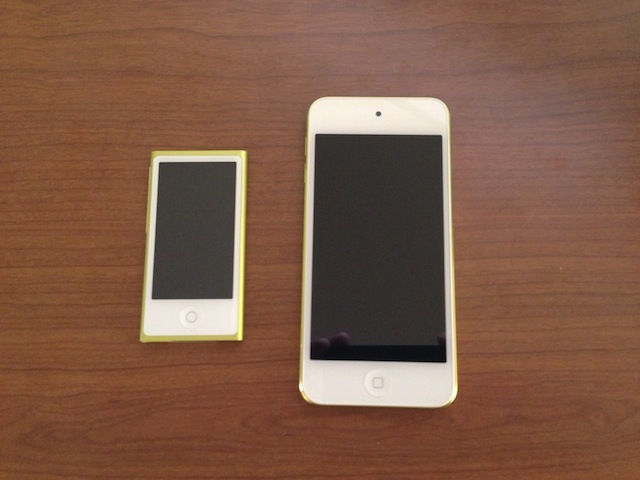 Previous generations of the nano also had larger screens, but this is the first one of this size with multi-touch. Using the screen to control media playback is a delight — it’s very condusive to using with your thumb. And you can do things like pinch-to-zoom in photos (though it’s not quite as smooth as it is on iOS). 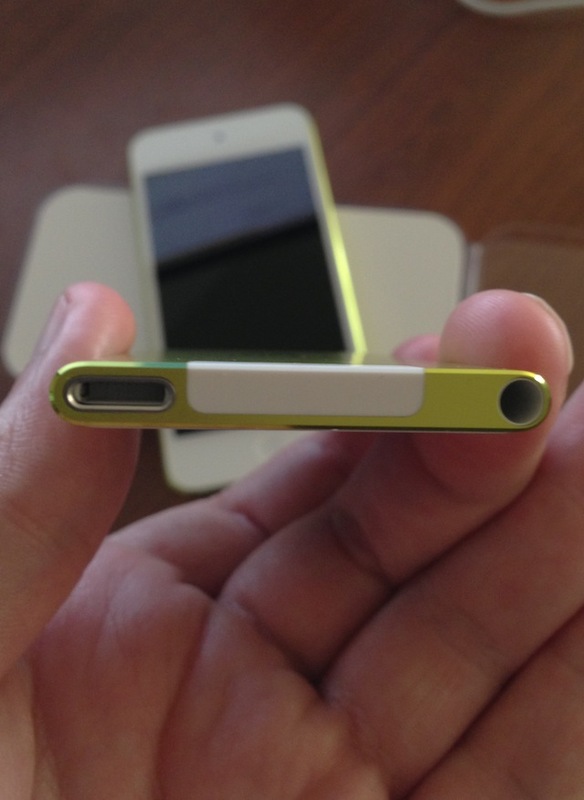 This nano also features the new Lightning connector that Apple debuted with the iPhone 5. This undoubtedly helped Apple make the new nano as skinny as it is (5.4mm). Like the new iPod touch, the thing stopping this device from getting skinnier now seems to be the size of a standard headphone jack. When the headphones are plugged in, the plastic around the connector is ever-so-slightly thicker than the nano itself. Crazy. As previously mentioned, this nano also comes in a variety of colors. (Apple even matches the background wallpaper to the color you choose.) And the unibody anodized aluminium looks and feels great. There’s no question that in some situations, I’m definitely missing my iPhone or the iPod touch — even when it just comes to music. It should be fairly obvious why. Because those devices can connect to the internet, I can use services like iTunes in the Cloud or Rdio or Pandora to access music that I don’t currently have on my device. Such cloud-based playback is clearly the future — and really, it’s already here. The syncing of music files between your computer and your device seems downright archaeic. Because that’s exactly what it is. To be fair, there are still millions of iTunes users with music files on their machines who still can and will appreciate the “offline” aspect of the nano. For example, in Europe, it’s great not to have to use any data to listen to music. And while I’m sure the U.S. carriers would love to gouge unsuspecting people in situations like that, there are still times you won’t be connected. But those times continue to fade away. A much better option for the future is syncing your cloud music with your player for offline playback. And again, Apple already does this with iTunes in the Cloud (though Rdio and Spotify are better at it). 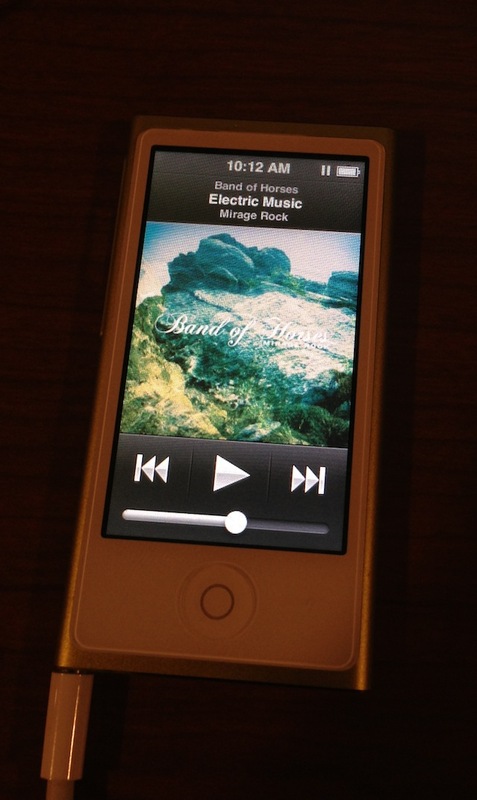 This is the way it has to and will work in the not-too distant future — yes, even for regular old iPods. I would not be shocked to see all but perhaps the cheapest iPods (the shuffle) come with at the very least iTunes in the Cloud support by next year. I’d say it will happen in two years max. Again, it’s just so obvious. One issue right now is the hardware. This nano does include Bluetooth for the first time, but it lacks WiFi. I suspect it was a design/battery life issue, but it’s a little perplexing. Bluetooth is great if you want to stream your music to something like a Jambox or a wireless headset. But as a feature, WiFi would make more sense. While we’re on the subject of physical syncing, how annoying is it that you still have to “eject” iPod hardware, even with the new Lightning connector? As in, you have to click the little eject button next to the iPod nano icon in iTunes or you’ll get an error message that you failed to eject the device properly. You don’t have to do this with the iPhone or iPad, just these small guys. One more slight annoyance/oddity: while the new nano comes with the new EarPods (which I love, though some still complain they don’t fit their ears), they’re different than the ones you get with the iPhone 5. They don’t have in-line volume and pause/play/skip controls. I have no idea why except that I believe these earphones are slightly different since the nano’s radio funtionality requires them to work. Essentially, I’m spoiled. I’ve already moved to a music streaming world, so this new nano — a pretty incredible device in just about every way — leaves me wanting more. My main point would be that I suspect many will feel the same way. And everyone will feel this way sooner rather than later. But Apple must know this too. They see the iPod sales continuing to slide downward. They know why. They’ll squeeze a little bit more life out of the manual sync iPods and then they too will go skyward, into the cloud — or they’ll cease to exist. Still, it has been nice to tap into my nostalgia for a few weeks. Me and my yellow music player. A device where I have to pick which songs I want to bring with me on a trip because I can’t instantly access them all. There’s something sort of romantic about that. But it’s a romance not long for this world.